Local, organic triple cream cheese? Check. Perfectly ripe pears? Got it. Sweet, soft cloves of garlic? Toss ’em on. 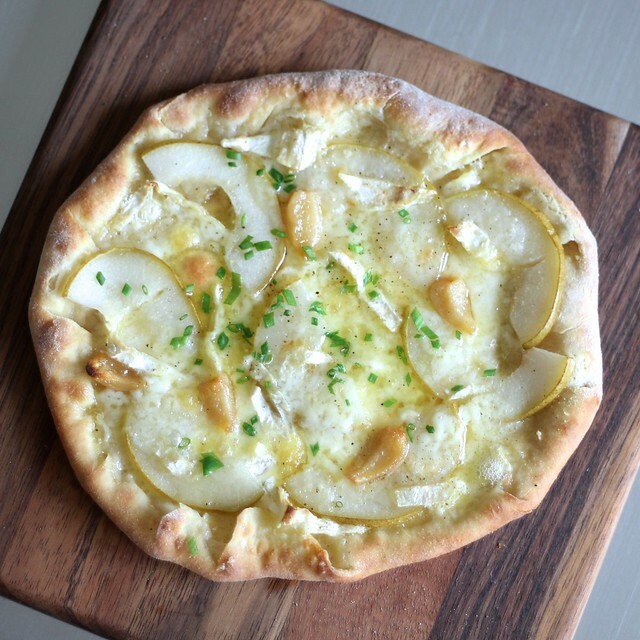 This indulgent gluten-free pizza is irresistible for fans of all of the above. 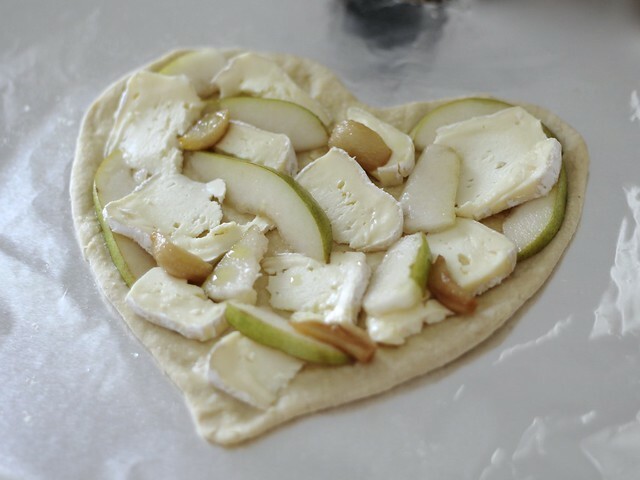 Together — baked in a searingly hot oven atop a thin, homemade crust — pure magic happens. Back in November, I enjoyed this very combo at a local pizzeria, Pizza Antica. (Check out their gluten-free menu here!) After one bite, I knew that I needed to recreate it at home. With Valentine’s Day upon us — and a Whole Foods cheese sale the week prior — the time had come. I highly recommend using Cowgirl Creamery’s Mt Tam, but another triple cream cheese will surely do juuust fine. 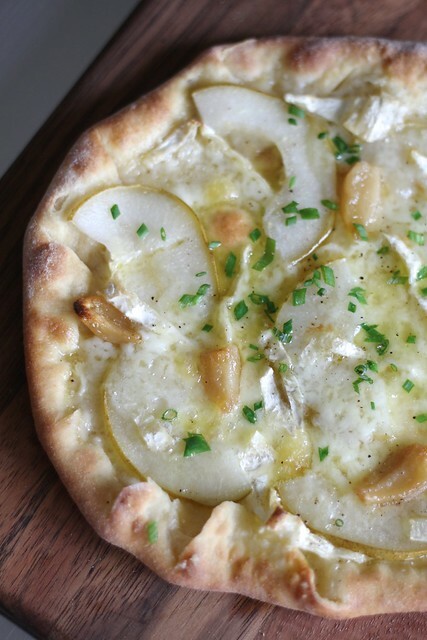 As for the garlic, trust that given the confit treatment it works mighty good with the cheese and pear — your house will smell divine and these pizzas will disappear in no time! What’s your favorite pizza topping combo? Style? Let’s talk in the comments or on Facebook or Twitter! Prepare dough according to directions. DO AHEAD: Dough may be made and fully risen a day or two ahead of time. Once risen, transfer to fridge. Bring to room temperature before using. About 15 minutes before the dough is ready, remove all but one rack from the oven. Place remaining rack on the lowest level, set a large, rimmed baking sheet upside down on top of it, and preheat to 500°F. Punch down dough and divide into 4 pieces (about 3.5 ounces each); cover with a barely damp cloth to keep moist. Roll one ball of dough out on a clean, millet flour coated surface into a very thin, about 1/8″ thick, circle. To form crust, fold the outside edges (about 3/4″) in, press to seal and roll again until it’s just about flat (see the first six photos here for a visual how-to). Transfer dough to a sheet of aluminum foil (crimp the edges of the foil, if desired). Avoiding the very outer 1/2″ of crust, brush surface with 1 teaspoon garlic confit-infused oil. 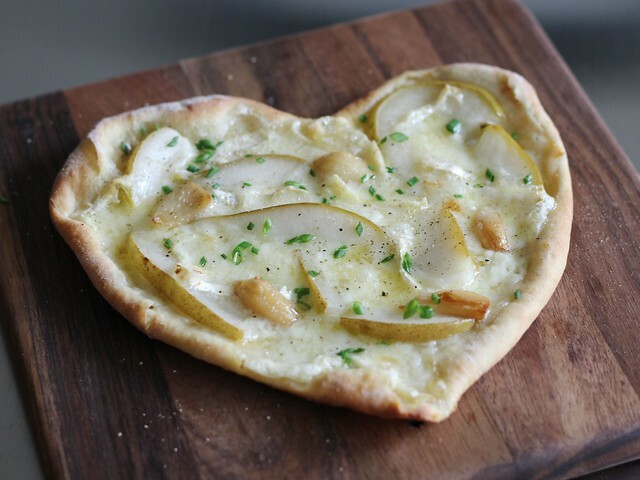 Top with 1/4 of the cheese, pear slices and garlic cloves. Repeat with remaining dough and toppings. Place pizza(s)², aluminum foil and all, onto the hot baking sheet. Bake for about 7 minutes or until crust is browned and cheese is nice and melty (it’ll get a touch greasy, and that is a-ok). Remove from oven, sprinkle with chives and ground black pepper. Serve immediately! ¹ Locate Mt Tam near you using Cowgirl Creamery’s cheese finder. Want an assortment of their awesome artisan cheeses delivered to your doorstep? Check out their offerings here. ² I can just fit two, in opposite corners, on the baking sheets I use.